In this contribution, we propose the notion of homotopy for both combinatorial maps and weighted combinatorial maps. We also describe transformations that are homotopic in the defined sense. The usefulness of the concept introduced is illustrated using two applications. The first one consists in calculating a skeleton using homotopic transformations of weighted combinatorial maps. The result is a compact combinatorial map describing the structure of the skeleton which may be viewed as a ”combinatorial map skeleton”. The second application consists in run length encoding of all the regions described by a combinatorial map. 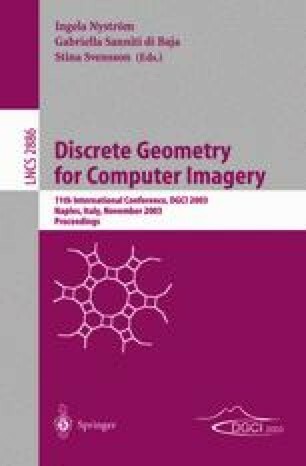 Although these demonstrations are defined on combinatorial maps defined on a square grid, the major insights of the paper are independent of the embedding.